You have a party to attend this evening. Even after having applied a few layers of foundation, you can still see your dark spots. Don’t you just hate it when that happens? Trust me, until a few weeks ago, I was sailing in the same boat. But, after having found these remedies for dark spots, I can happily say that my face is spot-free now. Dark spots are also known as age spots or black spots. They are discolored patches of skin that can appear on your face, shoulders, arms, or back and can be in shades of red, brown, or grey. These spots appear due to the oversecretion of melanin – the pigment responsible for the color of our skin. 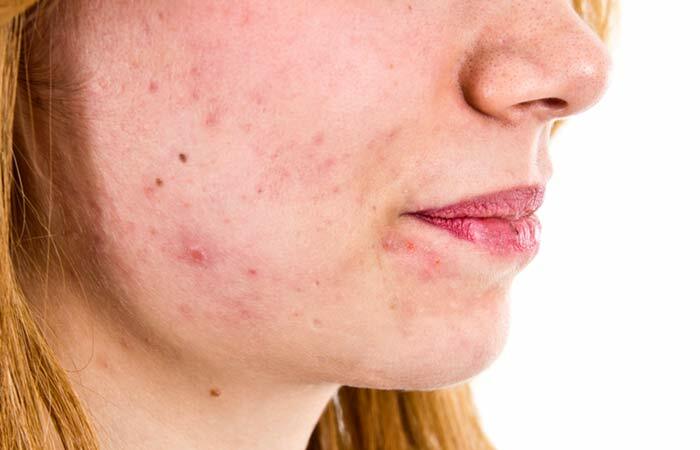 Though these spots may vary in shade and size, there is one thing they all have in common – they are a great source of distress for anyone afflicted by them. Instead of covering them with makeup, use the remedies listed in this article to lighten them naturally. The concoctions listed in this article will remove dark spots, nourish your skin, and also prevent any marks from developing in the future. 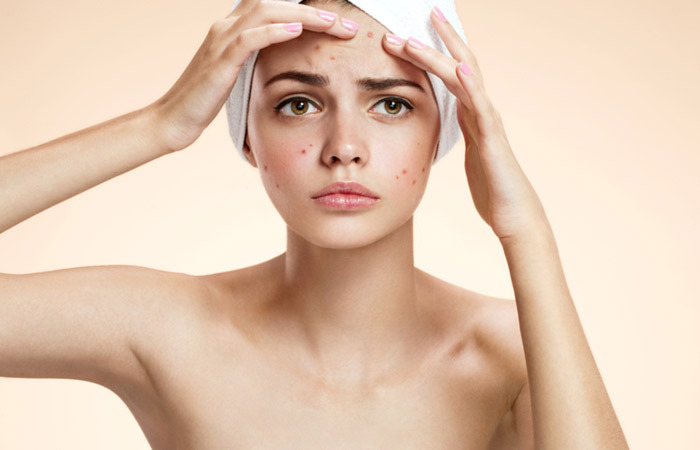 Keep reading to know more about dark spots and how to get rid of them. Excessive sun exposure: Spending too much time in the sun or on tanning beds without applying adequate amount of sunscreen can cause your skin to kick up its production of melanin. This is the body’s response to protect itself from the harmful ultraviolet rays, which in turn increases the number of dark spots on face. Hormonal changes: Fluctuation in the production of estrogen and progesterone when you are pregnant, on birth control pills, or going through menopause can cause uneven melanin production. Exposure to sunlight activates the secretion of melanin in these spots, causing dark spots. Facial hair removal: Removing your facial hair by tweezing, waxing, or using depilatory creams can cause skin inflammation. This can later lead to discoloration of skin in those areas. Acne / Injury: Scars left behind by pimples, injuries, or any kind of surgery can evolve into dark spots, instead of gradually fading away. 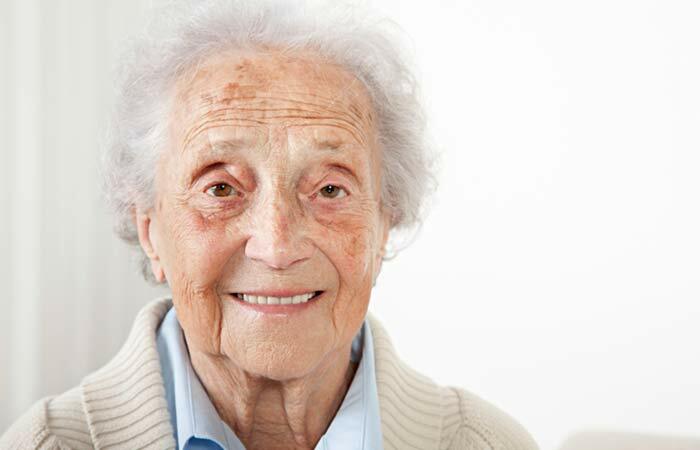 Aging: As you age, your skin cells do not reproduce as easily as they do in your youth. Thus, it becomes more difficult for your skin to repair damaged areas and get rid of discolored spots. Merely knowing the causes of dark spots is not enough. We also need to understand the different types of dark spots to understand which method might be suitable to get rid of them. We have compiled a simple list of these types for you below. You may be thinking, “Dark spots are dark spots. They’re all the same! Just tell me how to get rid of them!” However, it is very important to know what type of dark spots you have. It will not only make you more informed about your body but also allow you to choose the appropriate treatment to get rid of them. Melasma: Melasma refers to the dark spots that appear in a splotch-like form on the cheeks. Hormonal imbalances, hormonal therapy treatment or thyroid dysfunction can cause this kind of dark spots. Lentigines: Lentigines are dark spots that appear scattered and in no particular pattern. 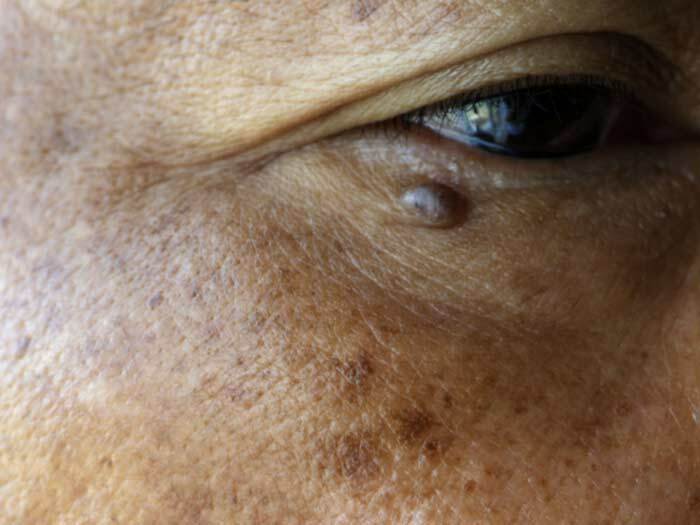 They are what we commonly refer to as ‘liver spots’ that appear on the skins of old people. They are a direct consequence of excessive exposure to the harmful ultraviolet rays of the sun. Pimple marks: When a pimple gets infected with any kind of bacteria, it can become very painful and leave a mark or scar after it pops. This mark can then evolve into a dark spot. Post-inflammatory hyperpigmentation: Any kind of injury or trauma caused to the skin as a result of abrasions, burns, acne, etc., leading to inflammation, can later cause the formation of dark spots in that area. Depending on the type of dark spot, you can opt for either a natural and homemade remedy or a cosmetic solution that will work the best to get rid of it. I get that they look unsightly and completely understand that they give you the urge to pile on as many layers of foundation as humanly possible. However, dark spots do not generally pose a health risk. So, going through any dermatological medical treatment to get rid of them is totally up to you. If you wish to undergo any cosmetic treatments, given below are some procedures you can consider. Laser Treatment: Laser treatment is a non-invasive procedure that is quite painless and gives quick results. Depending on the color and size of your dark spots and how deep they are, the laser for your treatment will be picked out. The number of sessions that will be required for your treatment will also depend on the same factors. It is very important to note that your skin will be highly sensitive after undergoing laser treatment. So, make sure to stock up on your sunscreen and also try to avoid going out in the sun for a few days. Chemical Peels: A chemical peel treatment involves the application of a chemical on your skin that will cause it to blister and peel off, thus activating the regenerative cells. A new layer of skin forms. Sounds scary, I know. But, in reality, chemical peels are relatively painless, though you may experience some tingling sensation. Depending on the darkness and depth of your dark spot, the chemical used to peel your skin will vary. A superficial peel will employ alpha-hydroxy acids like glycolic acid or lactic acid, while a medium level peel will use trichloroacetic acid. The strongest peels will use phenol. 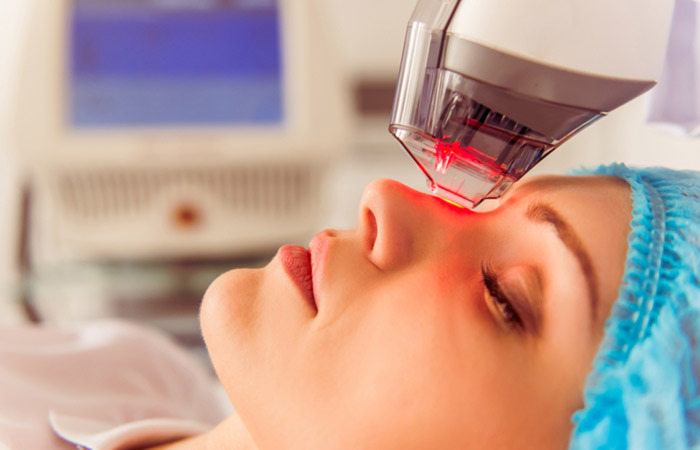 Again, as with laser treatment, the number of sessions will vary depending on the nature of your dark spots. Your skin will be highly sensitive after a chemical peel session. It will be inflamed, red, and flaky. It is of utmost importance that you make good use of your sunscreen and avoid going out in the sun for a few days after the treatment. You may also be prescribed some mild painkillers to soothe your inflamed skin. Microdermabrasion: Microdermabrasion is a non-invasive treatment that is used to rejuvenate your skin and it has been found highly effective in getting rid of dark spots. This treatment is, again, practically painless. The procedure begins with micro-exfoliating crystals being sprayed on to your skin, followed by tenderly suctioning them away. The combined effect of the exfoliating and suction-vacuuming is that not only are the superficial layers of your skin stripped away, but your collagen production is also rebooted. Thus, you get rid of your dark spots and also walk away with fresher-looking, glowing skin! Cryosurgery: This one is pretty interesting! Though it uses the word ‘surgery’, cryosurgery is actually a non-invasive treatment. In this procedure, liquid nitrogen is sprayed onto your dark spot using a spray gun to freeze it, which causes it to turn white. The doctor may repeat this process a couple of times depending on how deep-seated your dark spot is. This treated dark spot will then form a scab after a few days, which will shed off in a couple of weeks to reveal your new skin sans the dark spot. Do not pick on the scab under any circumstances as this may cause scarring. Keep it dry and, if recommended by the doctor, apply petroleum jelly to it. So, what do you actually do when you find dark spots on your face? Besides sulking, I mean. Because no matter how much bleach you assault your face with, those pesky discolored marks simply refuse to leave you alone. And going in for one of the dermatological treatments mentioned above is not a viable option for everyone. Well, do I have some great news for you! What if I told you that instead of heading to your nearest drugstore or dermatologist’s clinic, the only place you need to head to is your kitchen? I don’t blame you if you don’t believe me because it does sound too good to be true. But, the honest truth is, your kitchen is full of ingredients that work wonders for dark spot removal. And I am here to tell you exactly what you will need and how to use it. So read on to find out all the secrets to get rid of those pesky little buggers and restore your selfie-ready perfection! DISCLAIMER: All these home remedies need to be used regularly for at least a full month to see any real reduction in your dark spots. When life gives you lemons, by all means, make lemonade. But also use them to get rid of your dark spots! Immeasurable research done over many years has proved that the citric acid and vitamin C present in lemon make it the perfect bleaching agent, which is exactly what you need to lighten your dark spots (1). There are a variety of ways in which you can use this incredible ingredient, depending on the sensitivity of your skin. Lemon juice, by itself, is a great way to remove dark spots. However, in its concentrated form, it can be pretty harsh on your skin. So, using water to dilute the solution is a good idea, especially if you have sensitive skin. Squeeze the juice of a lemon into a clean bowl. Add equal parts clean, filtered water to the lemon juice. Use a cotton ball to apply lemon juice/water solution all over your face. Leave it on for 20 minutes, and then wash off with water. Do not use soap. The bleaching effect of the lemon juice and the cleansing property of yogurt create the combined result of lightening your dark spots and brightening your skin. Who doesn’t want to kill two birds with one stone, right? Add 1 tablespoon of yogurt to it and mix well. Apply the paste all over your face and leave it on for 30 minutes. The exfoliating benefits of sugar and the bleaching effect of lemon juice combined can make the perfect scrub to get rid of all your dead skin and give your face a refreshed glow. Squeeze the juice of half a lemon into a clean bowl. Add a teaspoon of sugar to the lemon juice and mix well (you can also add a teaspoon of coconut oil to the mixture if you have dry skin). Rub the mixture between your fingers and scrub all over your face using circular motions, giving special attention to the dark spots. Keep scrubbing for two minutes. Wash off with clean water and pat dry your face. Do not apply any home remedies containing lemon juice around or under your eyes as the skin in those areas is highly sensitive. Do not go out into the sunlight during or right after using a lemon juice home remedy as it makes your skin highly sensitive and can cause sunburns. 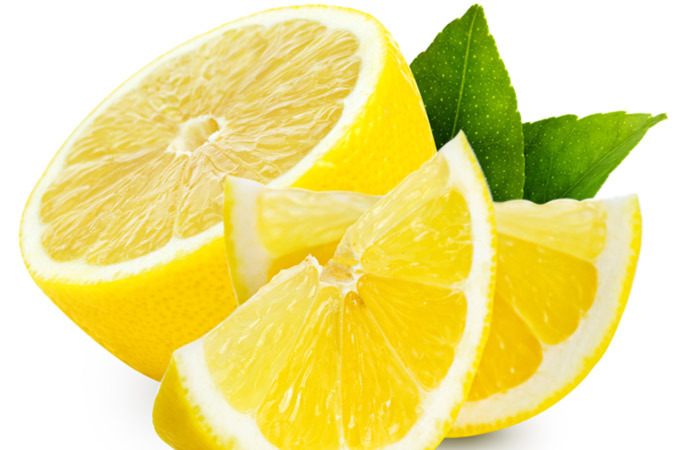 Use only freshly squeezed lemon juice as the packaged variety contains preservatives that can harm your skin. If you have sensitive skin, you could add honey or rose water to any of the above mixtures to make them gentler on your skin. Many dermatologists swear by the benefits of vitamin E oil to reduce the appearance of a variety of skin discoloration problems, especially dark spots. This is why it is one of the vital ingredients found in many skin care products. Vitamin E is an antioxidant that targets free radicals that are responsible for aging and discoloration and helps to repair damaged cells (2). Moreover, vitamin E oil does not need to be mixed with any other ingredients to make it viable for applying directly on your skin. Hence, it is a convenient and cost-effective option for dark spot removal. Apply a few drops of vitamin E oil directly on the dark spots and rub it into your skin with clean fingers. Daily, before going to sleep. Poke a hole in the vitamin E capsule with the help of a needle or a safety pin. Squeeze the oil out of the capsule onto your fingers. Apply it directly to your dark spots and rub it in. Some people could be allergic to vitamin E oil and develop contact dermatitis if they come in contact with it. Do a patch test on your forearm before trying out any of the home remedies mentioned above. Since vitamin E comes in a heavy formulation, it could cause your skin to break out if your skin is acne prone. Since vitamin E comes in the form of a thick oil and requires you to not wash it off, it could make your face look oily throughout the day. Hence, it is best to apply it at night, in place of a moisturizer. Add foods rich in vitamin E like almonds, peanuts, wheat germ oil, sunflower seeds, and dried apricots to your daily diet to make use of its many benefits. Ah, potato – the wonderful vegetable that gives us the simple joys in life, such as French fries, potato chips, hash brown, and tater tots. Besides giving us gastric happiness, potatoes can also do wonders for our skin. 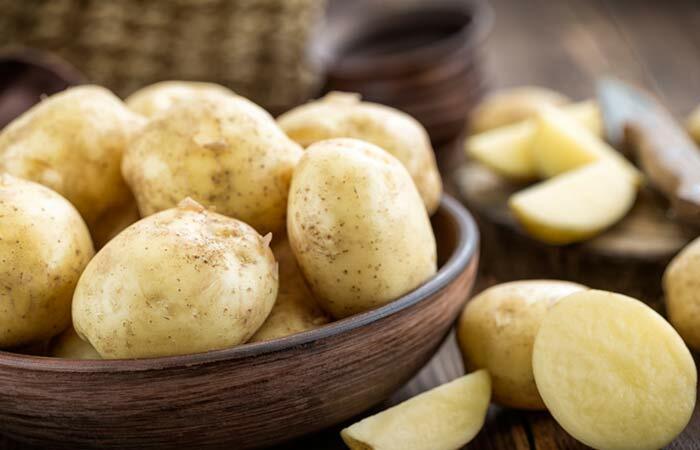 Starch and sugar – the key components of potato – work their combined exfoliating magic to remove dead skin cells and aid the growth of new ones. Vitamin B6, vitamin C, potassium, zinc, and phosphorus – minerals that rejuvenate the collagen production in your skin – are also found in this root vegetable (3). All in all, a potato is a storehouse of numerous minerals that work together to provide many skin care benefits. There are many different ways to use potatoes to remove dark spots. Read on below to find out our favorite picks. Let’s start off with the easiest one. You do not need anything except a potato and a knife for this one. Don’t you just love me for making your life so easy right now? Slice up a potato into thin slices with a knife. Apply a tiny bit of water to the potato slices to make them wet and place them on the areas with dark spots. Leave the potato slices on for 10 minutes. The combined bleaching properties of potatoes and lemon juice, owing to their rich vitamin C content, make this an excellent home remedy for dark spot removal and skin brightening. Slice up a potato into thin slices and soak them in a cup of boiling hot water. Leave the potato slices to soak for half an hour. Remove the potato slices and add a tablespoon of lemon juice to the water that is left behind. Refrigerate the potato water and lemon juice mixture for an hour. Apply the cold mixture directly to the dark spots using a cotton ball. Wash off with clean water after 20 minutes. The extensive skin care benefits of honey work wonders when combined with potato. They make an excellent face mask that can eliminate those dark spots right off your face. Grate the potato to a fine texture. Add a teaspoon of honey to the grated potato (if the mixture is too dry, you can add more honey or a little bit of water to it). Apply the mixture as a face mask and leave it on for 15 minutes. If you experience any redness or irritation after applying potato on your skin, wash off the face mask and discontinue use immediately. You can slice or grate up 3-4 potatoes at a time and refrigerate them in an airtight container. That way, you will not have to cut a fresh potato every day and the refrigerated potatoes will have a nice cooling effect on your skin. Buttermilk is the sour liquid left behind after butter has been churned out of the milk. Remember when I told you at the beginning of this article that a superficial chemical peel uses alpha hydroxyl acids? Basically, the lactic acid found in buttermilk is also a type of alpha hydroxyl acid. It helps remove dead skin cells from your face and lightens dark spots (4). So, instead of spending a ton of money on a dermatologist to get a professional chemical peel to remove your dark spots, you can just spend a couple of dollars on a carton of buttermilk to get the same results. The easiest and cheapest way to use buttermilk is to use it as it is, without mixing anything in it. Pour a little buttermilk into a small bowl. Using a cotton ball, apply the buttermilk directly onto your dark spots. Leave it on for 20 minutes and wash off with clean water. Buttermilk and tomato both have bleaching properties that can give you quicker results in your quest to get a dark spot-free face. In a clean bowl, add the buttermilk and tomato juice and mix thoroughly. Apply the mixture all over your face and leave it on for half an hour. 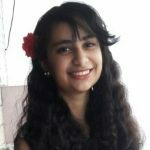 Do not apply any of the aforementioned buttermilk home remedies around and under your eyes as the skin there is highly sensitive and the lactic acid in the buttermilk can cause irritation. You can use milk or yogurt in place of buttermilk if it is difficult for you to find it, as they contain lactic acid as well. 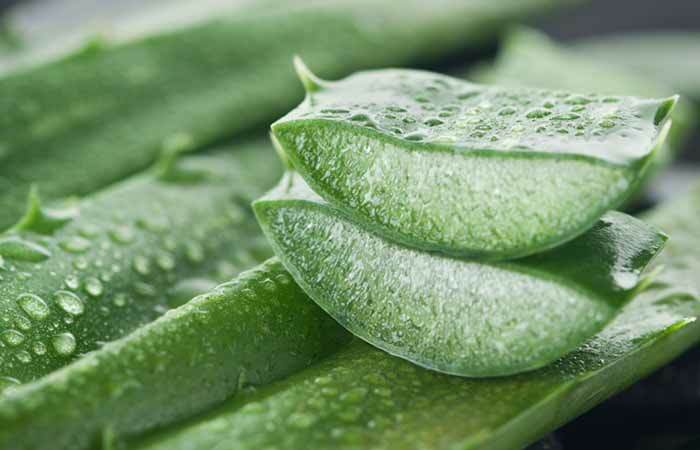 I think we have all been told an infinite number of times by innumerable people how aloe vera is the best thing that happened to their skin. But there’s a reason all these people and skin care companies make such grandiose claims about aloe vera. It contains 90% of the amino acids found in our body, in addition to vitamins A, B, C, and E. All these, along with the beta-carotene also found in this miracle plant, lead to this plant having miraculous anti-aging and skin nourishing properties. Besides providing quick depigmentation, removing dark spots, and treating sunburn, this wonder plant also has analgesic (pain relief) and antiseptic properties (5). And to cap it all off, aloe vera also works as an excellent moisturizer. Phew! That is way too much goodness packed into one spiky little plant. Anyway, here are our favorite ways to use aloe vera for dark spots removal. Aloe vera gel, taken straight from the leaves, is the best way to get rid of those black spots and any other discoloration. Using a knife, slice away the outer layers of an aloe vera leaf. Squeeze the gel onto your fingers and apply it directly to your dark spots. Leave the gel on for 20 minutes, then wash off with clean water. Sugar acts as an exfoliator to scrape away dead skin cells and the dual bleaching properties of aloe vera and lemon juice work wonders to eliminate your skin of dark spots, thus leaving your skin bright and glowing. Put the aloe vera gel, sugar, and lemon juice in a clean bowl and mix thoroughly. With clean hands, scrub the mixture onto your face for 10 minutes, giving extra attention to the areas with dark spots. Wash off with clean water and moisturize. People allergic to latex could experience irritation as a result of coming in contact with the component aloin that is found in the lining of aloe vera leaves. Thus, it is best to wear gloves while extracting aloe vera gel from its leaves. If you are allergic to garlic, onion, or tulips, you could be allergic to aloe vera. Do a patch test on the inside of your forearm before proceeding with any of the home remedies listed above. Invest in a potted aloe vera plant to keep at home. This way, you will always have it readily available for all your skin care needs. Consume aloe vera gel every day by blending it into a smoothie with another fruit to boost your health and get that natural glow. I’m pretty sure your mother, your grandmother, and basically every grown up in your life has, at multiple points in your life, raved about how almonds are the one solution to all your skin, hair, and memory problems. And why wouldn’t they? Almonds are loaded with oleic and linoleic acids, unsaturated fatty acids, phytosterols, and vitamins A, B2, B6, D, and E. Wowza! Makes you wonder how one little nut can hold so many nutrients, doesn’t it? Owing to all these wonderful goodies found in them, the oil extracted from almonds is considered somewhat of an elixir in the cosmetic and skin care industry. Thus, it is no wonder that almond oil is great for reducing dark spots, blemishes, and any other kind of unwanted pigmentation (6). Additionally, it also acts as an effective sunscreen by protecting your skin from the harmful ultraviolet rays of the sun. The best part? Almond oil is non-greasy, absorbs quickly, and is not too heavy on the skin – making it a great companion for anyone with sensitive skin. Bottled sweet almond oil can be found in any drugstore and one small-sized bottle can last you months. Rub a few drops of almond oil between your fingers and apply it all over your face as you would a lotion. Make sure to apply a little extra on the dark spots. Every night, before going to sleep. The vitamin E in the almond oil, the citric acid in the lime juice, and the lactic acid in the milk powder all combine to make one ultimate bleaching agent perfect for fighting those dastardly dark spots. The honey just adds that extra bit of moisture to relax the acidic properties of the other three ingredients. Mix the almond oil, lime juice, honey, and milk powder in a clean bowl. Apply the paste all over your face and leave it on for half an hour. Vitamin E oil and almond oil are two concentrated fluids that work beautifully to lighten your dark spots and add a glowy finish to your skin. In a small bowl or cup, add the almond oil and vitamin E oil. 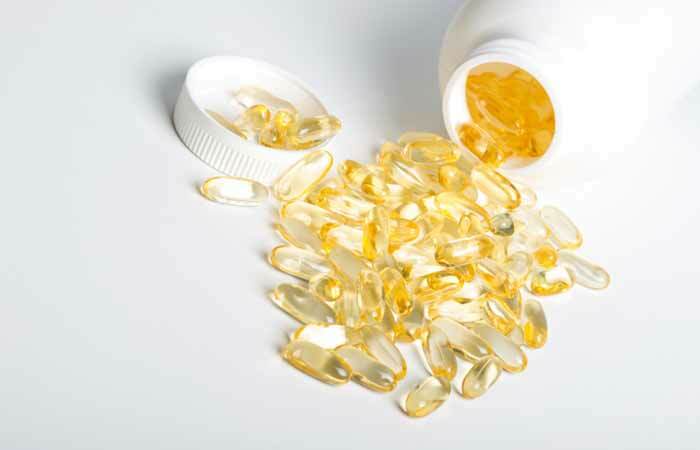 You can either use bottled vitamin E oil or extract the oil out of a vitamin E capsule. Heat the oil mixture for 10 seconds in a microwave. Apply it all over your face, like a lotion. On the dark spots, gently rub in the oils in circular motions for 10 minutes. Wipe away with a soft washcloth or tissue. 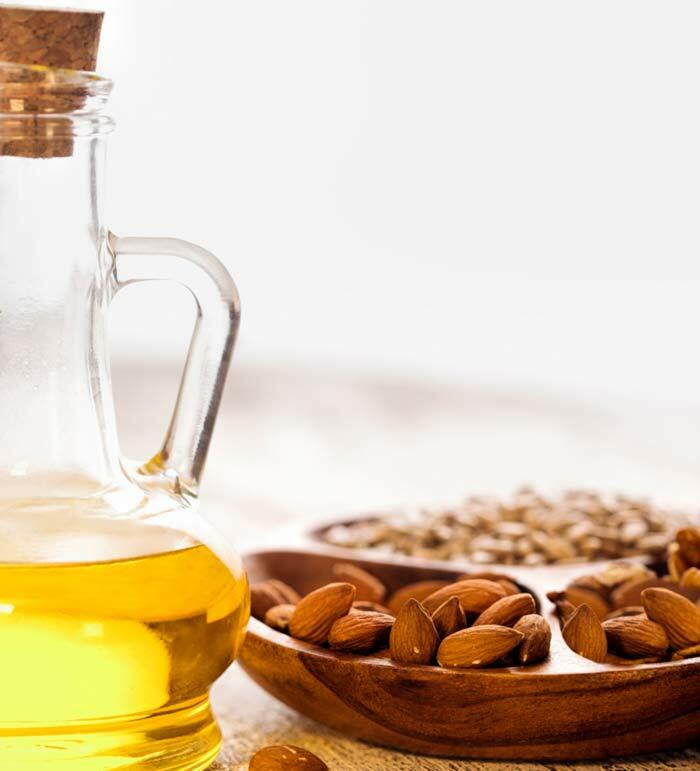 If you are allergic to almonds or any other tree nuts, stay away from almond oil as it can cause a pretty severe allergic reaction, even when used externally. Apply almond oil before you moisturize your skin (face and body) every night. You will wake up with ultra soft and moisturized skin. Since it is non-comedogenic (non-greasy and absorbs quickly), you can apply almond oil a few minutes before applying your makeup to prevent your foundation from clogging your pores and drying your skin out. Almond oil also makes for a great makeup remover that manages to wipe off even the most stubborn of waterproof mascaras. Add 4-5 almonds to your daily diet to reap its full depigmentation, hair strengthening, and memory boosting benefits. Oatmeal is not just a nutritious way to start your day, it can also be a great addition to your regular skin care routine and act as a weapon against those woeful dark spots. The texture of oatmeal and the saponins it contains makes it a great exfoliating and cleansing agent that scrubs away dead skin cells effectively. Its anti-inflammatory nature helps in soothing irritation and treating acne, acne scars, and dark spots (7). A unique feature of oatmeal is that it can balance the oil content in your skin, thus making it beneficial for both oily and dry skin types. All of these different properties of oatmeal come together to make it an excellent ingredient to use in home remedies for dark spot removal. The gentle exfoliation provided by the oatmeal, the moisturization by honey, and the bleaching by the lactic acid in the milk work excellently in removing dark spots. In a bowl, mix the ground up oatmeal, honey, and milk until it becomes a paste. The antioxidants found in green tea are not only good for digestion, but can also be used externally in a variety of home remedies (8). The gram flour and turmeric will give that extra glow to your skin. In a bowl, mix the ground up oatmeal, turmeric, gram flour, and green tea. Add enough water to the above mixture to make a thick paste. Apply the face mask all over your face and leave it on until it has dried completely. Make sure you grind the oatmeal into a fine powder before adding it to any face pack. Otherwise, its big grains and rough texture can scratch and irritate your skin. 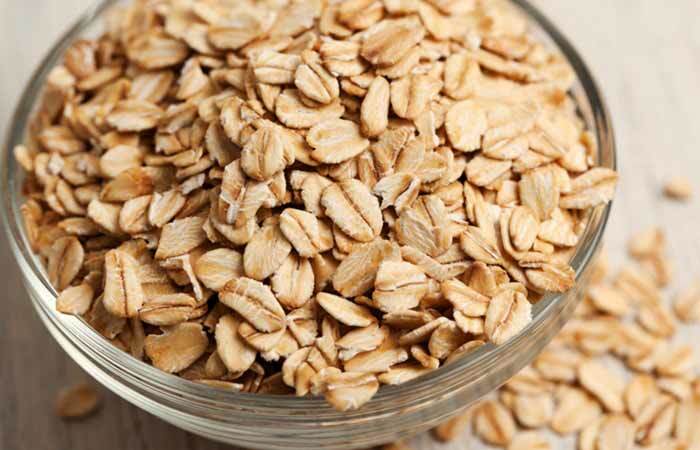 Since there is no chance of it going stale, you can grind up a full bag of oatmeal and store it in an airtight container to save time when using any of the aforementioned home remedies. In the second face pack, if you do not have loose green tea at hand, you can open and use the green tea in one tea bag. Chickpeas contain manganese that rejuvenates skin cells and attacks free radicals that cause wrinkles. The molybdenum in chickpeas detoxifies your skin and vitamin B repairs damage caused by the sun. 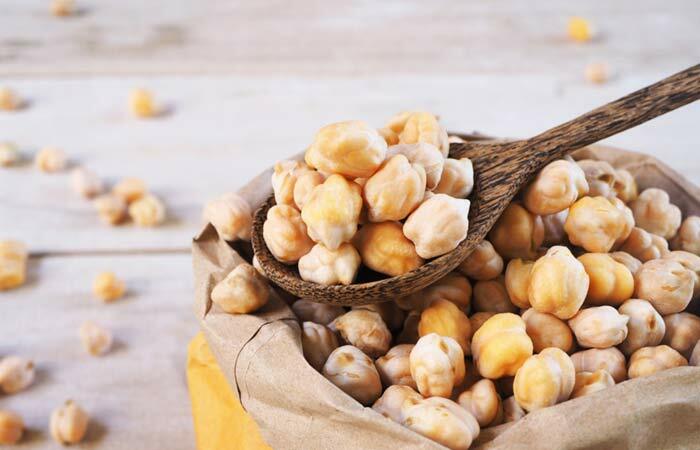 This spectacular combination of nutrients and minerals, along with their exfoliating property, make chickpeas perfect for scrubbing away dead skin cells and getting rid of dark spots and any other kind of discoloration (9). Listed below are some of the best ways to use chickpeas for effective dark spot removal. The best way to make use of chickpeas for removing age spots from your face is to use them in the concentrated form. Boil the chickpeas in water until they are completely soft. Once it has cooled down, blend the chickpeas and water until they form a thick paste. Adding lemon juice to the chickpeas paste accelerates their bleaching effects and gets rid of dark spots faster. In a bowl, mix the chickpeas paste and lemon juice until they make a thick paste. Apply the paste all over your face, giving special attention to your dark spots. Since chickpeas paste is quite thick and heavy on the skin, it could clog up your pores if you have sensitive skin. You can make a paste out of 1/2 kg of chickpeas at a time and store it in the refrigerator for your convenience. If you do not wish to use chickpeas paste, you can also use gram flour (flour made out of chickpeas), which is readily available in the market. If you, like me, grew up in India, then you already know all about the importance of turmeric in Indian culture. Not only is it an essential ingredient in Indian cooking, turmeric is also a quintessential part of the ‘Big Fat Indian Wedding.’ So much so that one whole ceremony is christened after and revolves around this beautiful spice, in which the bride and the groom are slathered in turmeric paste from head to toe to give them a special wedding glow. Turmeric contains curcumin, which is a powerful antioxidant that fights free radicals and helps in removing dark spots from your face (10). Since its highly pigmented yellow color may seem daunting to put on your face by itself, here are a few home remedies you can try that use turmeric in addition to some other great ingredients to fight off dark spots. 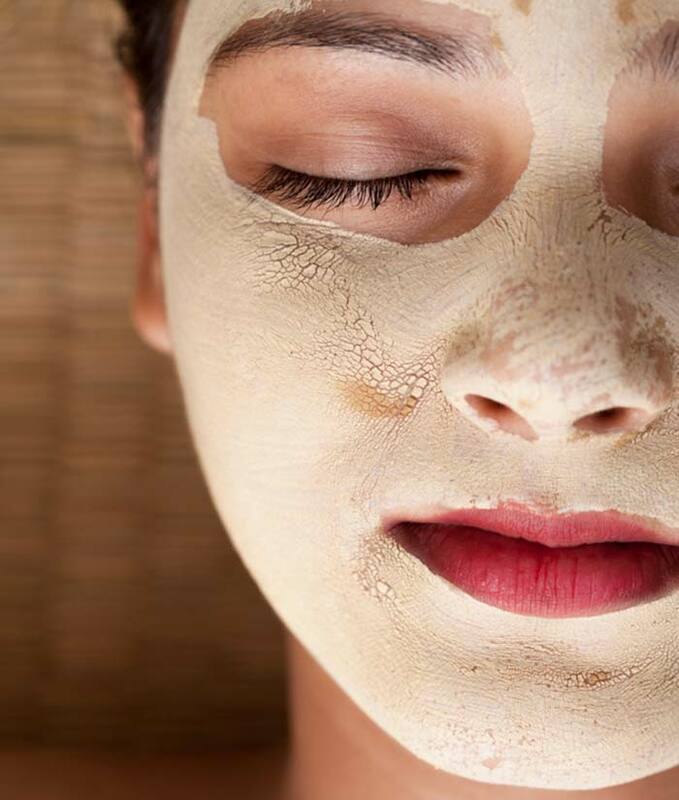 With milk acting as the base, turmeric and lemon juice come together to make a great face mask that lightens dark spots and brightens your skin. Mix the turmeric, lemon juice, and milk in a bowl. Apply the thin paste all over your face. Gently massage the paste into the areas affected by dark spots. Wash off with clean water after 15 minutes. While turmeric and yogurt fight those annoying dark spots, olive oil pampers your skin and moisturizes it from within (11). Mix the turmeric, yogurt, and olive oil in a bowl. Apply the paste all over your face and massage the dark spots areas in circular motions. Leaving any face masks containing turmeric on for more than 15-20 minutes can stain your skin yellow, which could take days to come off. Therefore, make sure you wash off the face mask within that time period and use a cleanser immediately to wipe off any excess face mask left behind. Avoid using any turmeric face packs a day before any major event as your skin will have a slight yellow twinge to it for a few days after application. Wear a towel around your neck or just wear clothes you don’t really care about when using these home remedies so you don’t stain your nice clothes yellow. Oh, parsley. I sincerely apologize for hating you all throughout my childhood. If I knew then what I know now, I would’ve relished every bite of you and made sure to go back for second helpings. To make up for my childhood shortcomings, let me tell you why you should immediately stock your fridge with parsley. This green leafy vegetable is loaded with vitamins A and C that renew the collagen production in your skin and fight free radicals to give you fresh even-toned skin, free of all acne and dark spots. On top of that, its vitamin K content prevents formation of wrinkles. Lastly, the antibacterial and antifungal nature of parsley give you overall clean and healthy skin (12). The combined vitamin C content of parsley and lemon juice come together to make a wonderful home remedy to fight any discoloration on your face. Chop up the parsley, add a little water to it, and blend it up to make a paste. Add the honey and lemon juice to the parsley paste and mix thoroughly. Apply the mixture all over your face, giving special attention to your dark spots. This parsley and lemon infusion made like a tea is light on your skin and very refreshing, though it works just as well to remove dark spots. Chop up the parsley it in 2 cups of water for 10-12 minutes. Strain the water into a clean bowl. Add a tablespoon of lemon juice to this parsley water. Using cotton balls, apply the parsley and lemon ‘tea’ directly onto your dark spots. Wash off with clean water after half an hour. 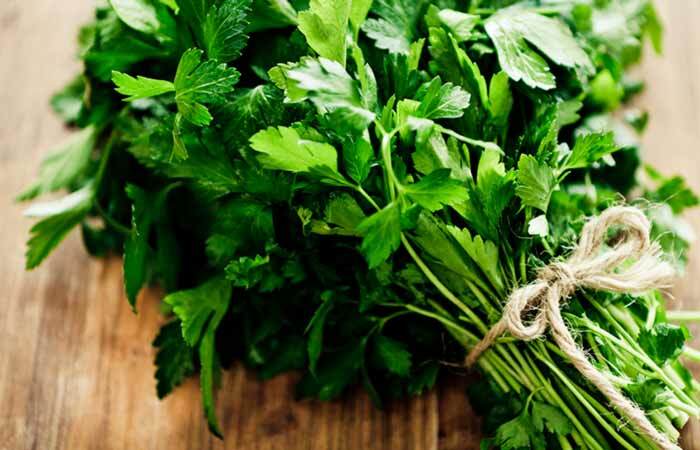 In some cases, people with sensitive skin can develop photodermatitis after handling parsley. Photodermatitis refers to the development of rashes or blisters as a reaction to the UV rays of the sun. Hence, do a patch test on your forearm before using any of the above home remedies. The parsley and lemon juice ‘tea’ water can be stored for days in a spray bottle and sprayed on whenever you feel like it. Castor oil is truly a thing of beauty. Enriched with omega-3 fatty acids, castor oil goes beyond the epidermal layer of your skin and deep cleans all the dirt, oil, and dead skin cells that have made their home there (13). Castor oil, aided by its vitamin E content, also increases blood circulation and boosts the growth of new skin cells, thus getting rid of dark spots and acne scars. But that’s not all! 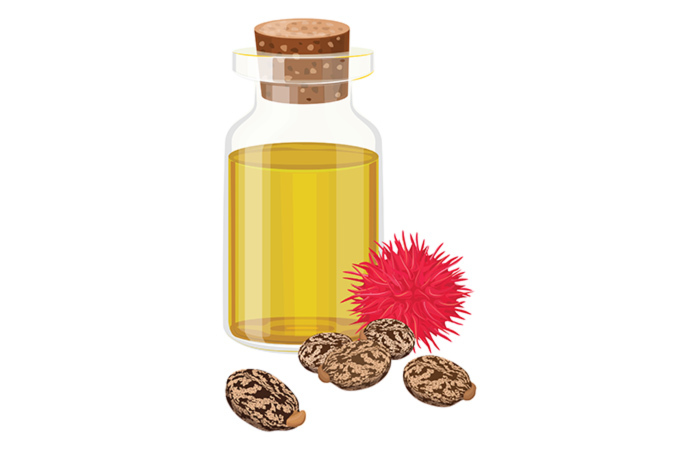 Castor oil not only removes dark spots and other discoloration, it effectively prevents them from coming back! Thus, you are blessed with an even skin tone in the long run. So, read on to find out how we use this wonder oil for dark spot removal. Just go straight in with that castor oil. You can thank me later! Pour 4-5 drops of castor oil on a cotton ball and apply directly to the dark spots. Leave it on for an hour and then wash off with clean water. Every day, once after waking up and once before going to sleep at night. Coconut oil has become a one-stop solution to every beauty problem imaginable (14). So, it’s no surprise that it managed to make its way onto this list as well. In a clean bowl, combine the castor oil and coconut oil. Using a cotton ball, apply this oil mixture all over your face and leave it on for 15 minutes. If you are pregnant, do not use any castor oil, internally or externally, as it has been found to induce labor and can also cause complications if not used in the correct manner. Do not apply castor oil on or around pimples or open wounds. Apply castor oil before your daily moisturizing routine and leave it on throughout the day to reap its maximum benefits. Okay, I know what you are thinking – “How can you possibly expect me to rub a stinky onion all over my face?” All I can say is, trust me on this. Or more importantly, trust research on this. 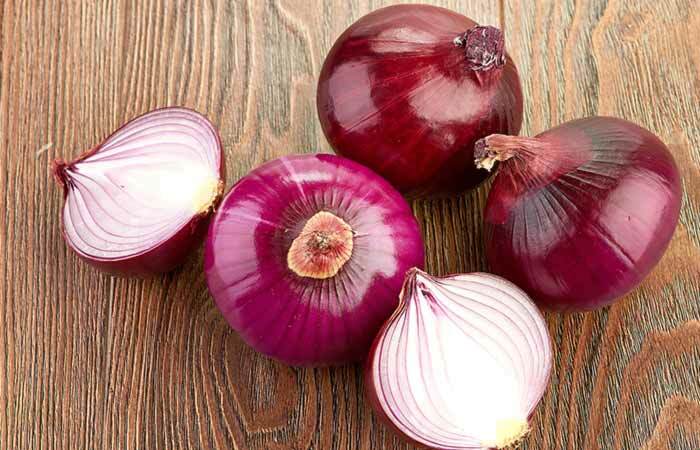 Onions are loaded with vitamins A, C, and E – powerful antioxidants that protect your skin from the ultraviolet rays of the sun and the free radicals that cause it to wrinkle and age. These, combined with the sulphur-rich phytochemicals, work together to help you get rid of all dark spots and even out your skin tone (15). So, embrace those stinky onions and read on to find out how you can use them to your skin’s benefit. I’m sorry that this is one malodorous concoction. But it is a strong one that will help you get rid of those dark spots much faster. Blend the onion and garlic together and strain out their juice. Using a cotton ball, apply the onion and garlic juice on your dark spots areas and leave it on until it dries completely. While the onion juice works hard to fight off those annoying dark spots, the honey pampers and moisturizes your skin. Mix the onion juice and honey in a clean bowl. Using a cotton ball, apply the mixture to your dark spots. Leave it on for 30 minutes, then wash off with water. Get ready for a pamper session with this face pack that will not only reduce your dark spots but also give you a glowing complexion. Mix the onion juice, gram flour, and rose water in a clean bowl until they form a thick paste. Apply the face pack all over your face and leave it on for 30 minutes. Do not use any onion home remedies a day before any major event as it leaves behind a slightly pungent odor. Use a fragrant facial cleanser after using any home remedies with onion in them to get rid of the strong odor. Not gonna lie, pineapple is my favorite fruit of all time. God, it’s so delicious!But, getting back to the point, who knew this yummy fruit had so many skin care benefits? It is rich in antioxidants and vitamins A and C that fight free radical damage and also increase the production of collagen. All of this helps fight pigmentation and dark spots. Additionally, pineapple also contains bromelain, a component that makes your skin firm, soft, and increases its elasticity, which prevents the formation of wrinkles (16). So what are you waiting for? Go stock up your fridge with pineapples, and I’ll tell you how to use them to fight those pesky dark spots. Once you’ve resisted the urge to chug all that pineapple juice, go ahead and try out this simple home remedy that will give you blemish-free skin. Blend a quarter of a pineapple and strain out its juice. Using a cotton ball, apply the pineapple juice on your dark spot areas and leave it on until it dries. Honestly, you can straight out eat this face pack for breakfast because it is so damn delicious. But also, the lactic acid of the yogurt works beautifully with the antioxidants in the pineapple to even out your skin tone and make it dark-spot free. Combine the pineapple juice and yogurt until they make a thick paste. Apply the paste all over your face and leave it on for 25 minutes. Do a patch test of pineapple juice on your forearm to check if your skin reacts negatively to it. Do not use store-bought pineapple juice because it contains chemical preservatives that may damage your skin. You can extract the juice of one full pineapple and use it for your home remedies as and when required, thus saving time. 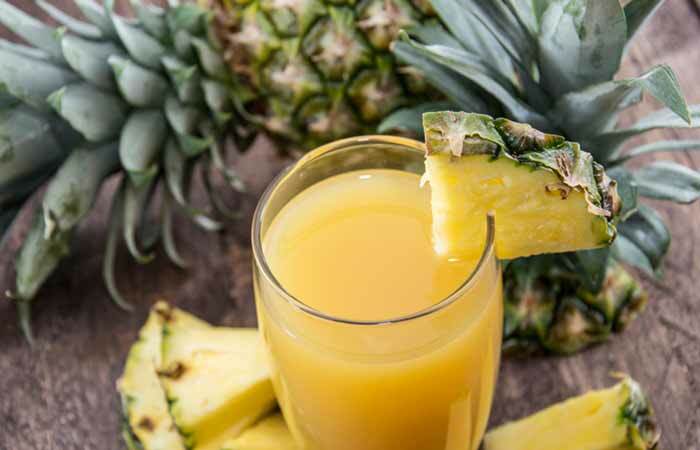 Drink a glass of pineapple juice every day to make full use of its benefits. Apple cider vinegar has emerged as a healthy must-have-at-home ingredient in the last few years. And rightly so. It’s chock full of antioxidants like vitamins A, B-complex, C, and E that work overtime to give you the healthiest skin possible. It also works wonders in removing dark spots as it contains alpha hydroxy acids. This is the same chemical that is used in chemical peels to remove dead skin cells and facilitate the production of new skin cells, and works as an exfoilant (17). It also contains malic acid that prevents acne and optimizes the production of sebum, making sure your skin is neither too oily nor too dry. Need more convincing? Apple cider vinegar also draws the toxins out of your skin and keeps wrinkles at bay, thus maintaining the youthful glow of your skin. 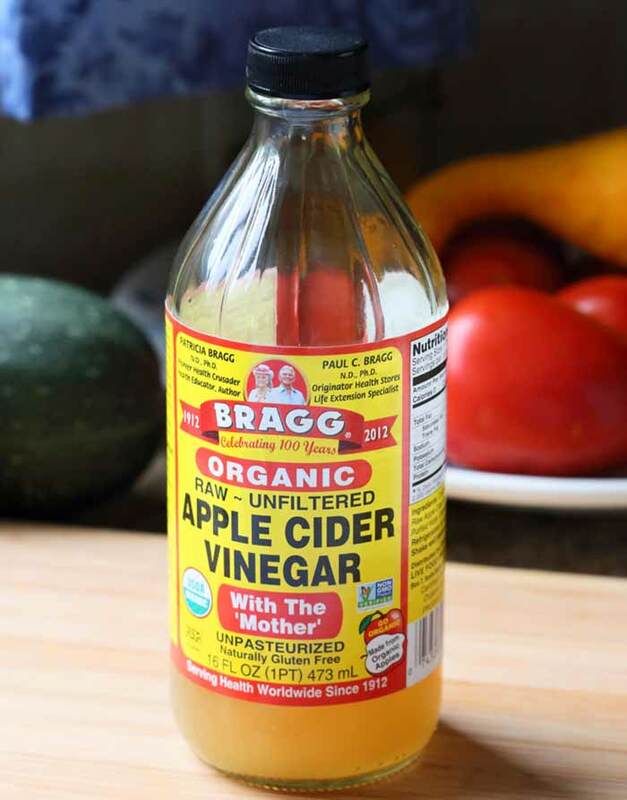 So, read on to find out how you can to use apple cider vinegar to get rid of those dark spots. The strong apple cider vinegar and the relaxing honey come together beautifully to make the perfect remedy for your dark spots. Dilute the apple cider vinegar with water and then add honey to it. Using a cotton ball, apply the mixture to your dark spots areas and leave it on for 15 minutes. In a clean bowl, mix the apple cider vinegar and orange juice. Apply the mixture to your dark spots areas with a cotton ball, and leave it on until it dries. Make sure you use a sunscreen when going out after using these remedies as apple cider vinegar makes your skin sensitive to the UV rays of the sun. If you have sensitive skin, do a patch test of apple cider vinegar on your forearm to check how your skin reacts to it. Always dilute apple cider vinegar before applying it as it can cause your face to sting slightly. 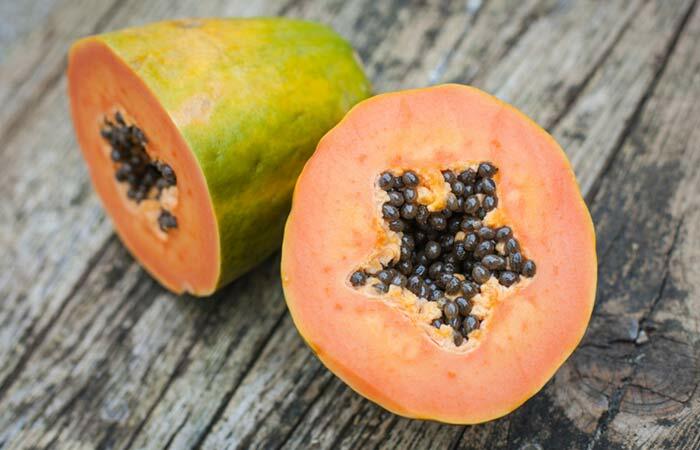 Papayas contain the papain enzyme, which basically acts as an antidote for dark spots. The papain enzyme does everything required for dark spot removal – it exfoliates, scrapes away dead skin cells, and evens out your skin tone (18). But, the most important thing it does is that it inhibits the production of tyrosinase in your skin. This enzyme is the main culprit behind the overproduction of melanin and the eventual appearance of dark spots. Use papaya in its most natural, concentrated form to see quick results in your quest to remove dark spots. Blend the papaya until it becomes a thick paste. Apply the papaya paste all over your face and leave it on for 20 minutes. In a clean bowl, mash up the papaya with a fork and mix in the oatmeal and coconut oil until it makes a thick paste. Since the pulp of papaya contains latex, make sure you do a patch test on your forearm to check if you are allergic to it, especially if you have sensitive skin. Who doesn’t love tomatoes? I mean they give us the most commonly used condiment around the world, i.e. ketchup. But did you know that these juicy red vegetables are a host to a number of components that can give us healthy and glowing skin? Tomato contains vitamins A, B, and C that boost collagen production, reduce dark spots, fight free radicals, and maintain the elasticity of your skin. It also contains minerals like calcium, potassium, and magnesium that moisturize and promote the overall good health of your skin (19). Tomatoes also contain lycopene – a component that moisturizes your skin from within and keeps wrinkles at bay. The bleaching property of the lemon juice and the collagen rejuvenation provided by the tomato juice work together to eliminate dark spots from your face. Mix the tomato juice and lemon juice in a clean bowl. Using a cotton ball, apply the juice mixture all over your face, giving special attention to the dark spots. Wait until it dries, then wash off with water. The sugar exfoliates and removes the dark spots while the tomato works to bleach the dark spots. Pour the sugar on a flat plate. Take a slice of tomato and dip it in the sugar until one side of the slice is completely covered with it. With the sugar-covered side, start scrubbing your face in circular motions for 10 minutes, paying special attention to your dark spot areas. Once your whole face is covered in the tomato and sugar scrub, leave it on for another 10 minutes. 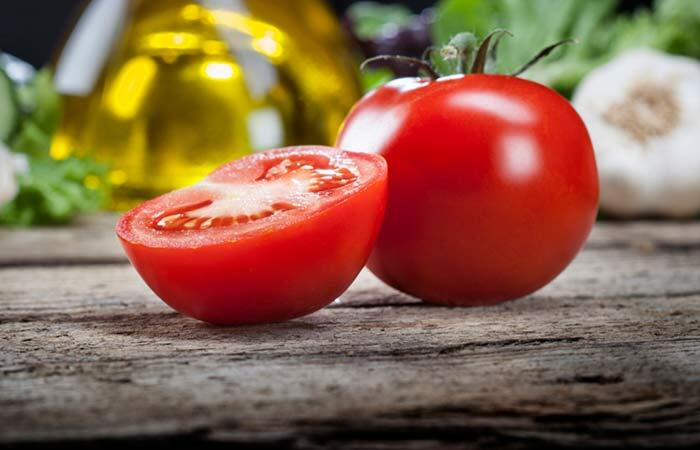 Since tomatoes are acidic in nature, they can be slightly hash on sensitive skin. Hence, do a patch test before going ahead with any tomato-based home remedies. Use fresh and organic tomatoes instead of non-organic ones to reap the most of their benefits. Add tomato to your daily diet to get the most of its lycopene content. Sandalwood has been used in face packs since time immemorial and is a huge part of Ayurvedic skin care practices. And to top that, it has the most wonderful fragrance, which makes it one of the most used ingredients in cosmetic products. Sandalwood is mainly comprised of beta santalol, santyl acetate, and santalenes. These components make it a great antiseptic and provide relief from inflammation. 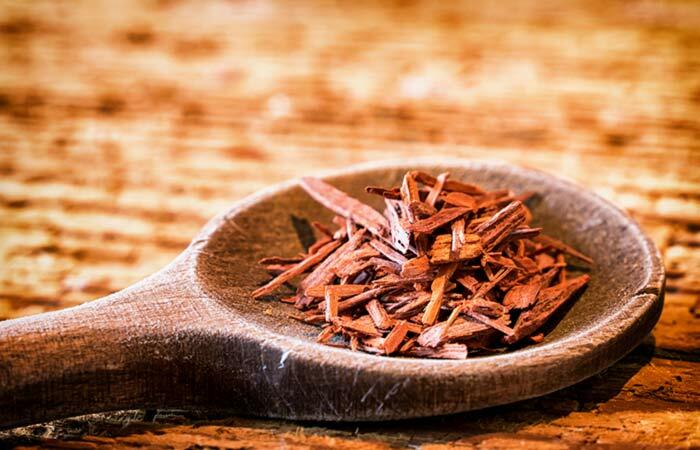 Sandalwood also has great anti-aging properties. It helps to make your skin smooth and taut and keeps the wrinkles away. But the most important property of sandalwood is that it is a spectacular cicatrisant. This means that it quickly heals and reduces any kind of pigmentation, like scars and dark spots (20). And, that is exactly the kind of thing we are looking for here. So read on to find out the most effective ways to remove dark spots using sandalwood in home remedy face packs. In this face pack, the sandalwood and milk bleach out the dark spots while the glycerin softens and smoothens your skin to give you glowing skin all over (21). In a clean bowl, mix the sandalwood powder, milk, and glycerin until they make a thick paste. These ingredients, when combined, remove dark spots and boost the collagen production to give you the most flawless skin possible. In a clean bowl, mix the sandalwood powder, orange juice, and vitamin E oil until they make a thick paste. There are not many risks associated with the use of sandalwood. The only point to consider is that sandalwood is quite expensive and regular usage may leave a dent in your wallet. Since sandalwood itself can be pretty expensive, you can buy economically priced sandalwood powder online or from a local beauty story, and reap the same benefits. We’ve all heard the old adage “cool as a cucumber.” But have you ever wondered what makes a cucumber so cool? Its 96% water content, of course! This high water content makes it a great moisturizer for your skin. 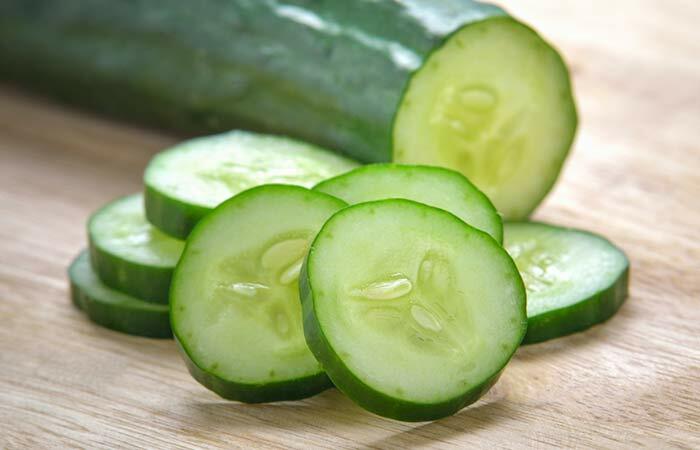 Cucumber also contains cucurbitacins and cucumerin, which make it great for delaying the signs of aging. It also has all the essential antioxidants like vitamins A, B5, C, E, and K that fight all sorts of skin discoloration like dark circles, acne scars, freckles, and – most importantly – dark spots. Additionally, cucumbers are also a source of silica, which is important for the synthesis of the collagen that rejuvenates your skin (22). Cucumber, aloe vera gel, and lemon juice have all been found to effectively fight dark spots, acne scars, and blemishes. Blend the cucumber to a pulp and then add the aloe vera gel and lemon juice to it. Apply the mask all over your face and leave it on for half an hour. Both cucumber and yogurt reduce dark spots, moisturize your skin, and give it that healthy glow you seek. Blend the cucumber and yogurt until they make a thick paste. Apply the paste all over your face and leave it on for 40 minutes. There are no known risks of using cucumber externally, so you can use any of these home remedies without any qualms. Honestly, do I really need to tell you how milk is good for your health? Because I’ll just repeat everything your parents have already told you since you were a kid. OK, then let me just tell you why milk is going to be the savior for your dark spot-ridden skin. First up, it has vitamin A and biotin, which give new life to your dry skin. Then there’s vitamin D and calcium that boost the collagen production in your skin. The vitamins A and B6 make sure your skin keeps up its production of new cells. But most importantly, the lactic acid, vitamin D, and vitamin B12 remove the dead skin cells from your skin and fight all kinds of pigmentation, especially dark spots. Hence, its dark spot reduction property, combined with the way it combats free radical damage and slows down the aging process, makes milk your best bet to get rid of all your dark spots (23). So, here’s how we like to use milk in our fight against dark spots. The lactic acid of the milk combined with the gentle healing property of honey come together to make a dark spot removal face mask fit for a queen. Mix the milk and honey in a bowl. Using a cotton ball, apply the paste all over your face. Massage it into your dark spots in circular motions for about 10 minutes. Leave the paste on for another 10 minutes, then wash off with water. The origin of milk, turmeric, and sandalwood face packs can probably be found in ancient Ayurvedic skin care practices. And, of course, they have managed to stick around for so long because they work wonders when it comes to dark spot removal. 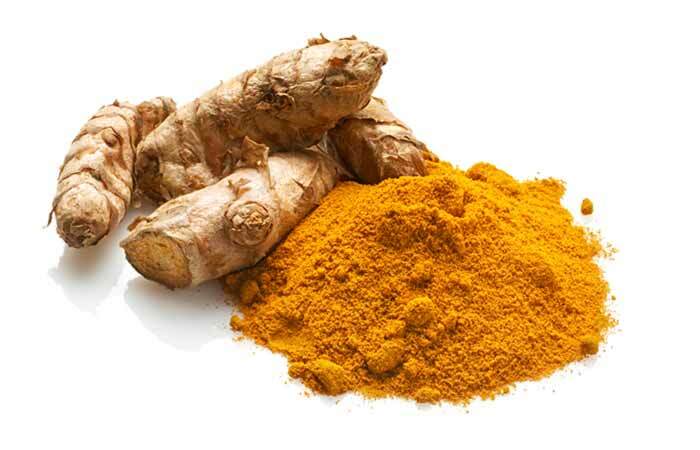 Mix the milk, sandalwood powder, and turmeric in a bowl until they make a thick paste. Apply the paste all over your face and leave it on until it dries completely. 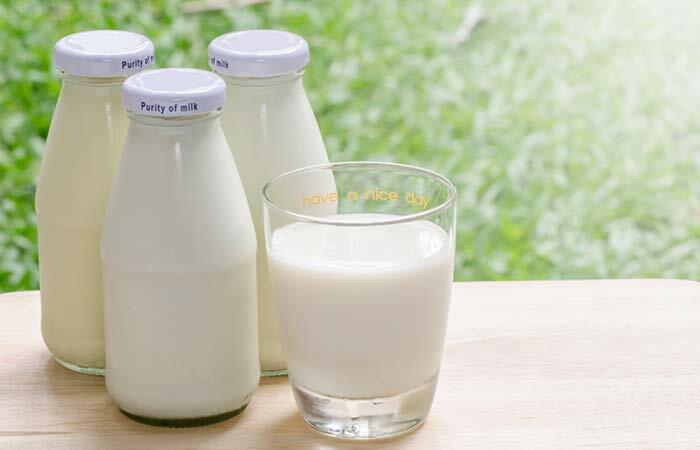 People with acne-prone skin could experience breakouts after coming in contact with milk. For them, it would be better if they substituted buttermilk or yogurt for milk in the home remedies given above. The regular milk that you buy usually comes from livestock that have been injected with hormones to increase their lactating capacity. These hormones pass down into the milk and enter your system when you consume the same, wreaking havoc on your skin. So, try as much as possible to use organic milk to avoid these side effects. Since the increase in health consciousness in the general public in recent years, yogurt has quite firmly placed itself as one of the most popular breakfast items around the world. Though eating yogurt has some great health benefits, its external use can also provide you some amazing skin care benefits. The lactic acid in the yogurt helps peel away the topmost layer of your skin that is comprised of dead and pigmented skin cells. This paves the way for new skin cells to be produced (24). Thus, it effectively removes your dark spots. Additionally, yogurt also moisturizes and tightens your skin, facilitating a youthful glow on your face. 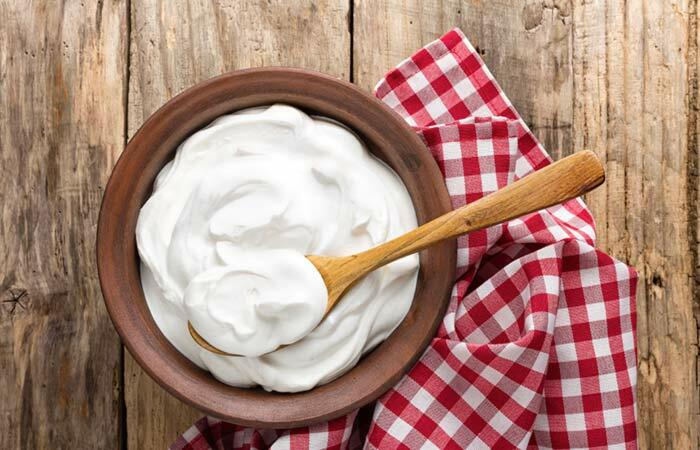 Read on to find out our recommendations on how to use yogurt in your skincare routine. Yogurt, oatmeal, and lemon juice all contain antioxidants and bleaching properties necessary for eliminating every last one of those dark spots. Mix the yogurt, oatmeal, and lemon juice into a thick paste. Apply the paste all over your face and leave it on for 20 minutes. While the yogurt fights your dark spots, the mint acts as an antibacterial and the rose water prevents your skin from aging. Blend the yogurt, mint, and rose water into a paste. 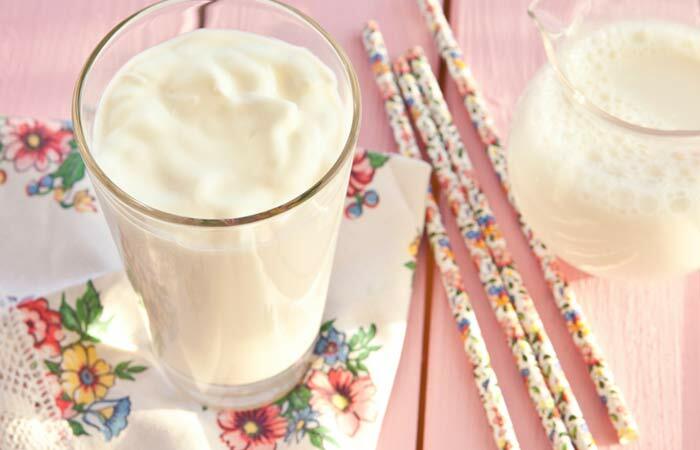 Do not use flavored yogurt for any of these home remedies as they contain artificial flavoring, colors, and preservatives that could react undesirably with your skin. Try adding a cup of yogurt to your daily diet as it will not only give you clear skin but will also be good for your digestion. Now you may be thinking ‘Are you serious? Horseradish?! Won’t it be too harsh on my skin?’ Yes, horseradish is quite a hot vegetable, but that is exactly what makes it great for removing those stubborn dark spots off your face. It contains vitamin C that acts as a powerful antioxidant and fights the free radicals in your skin that are the main factor behind the visible signs of aging (25). The vitamin A, B-complex vitamins, zinc, potassium, magnesium, and calcium content of horseradish all work together to scrape away dead skin cells, rejuvenate the collagen content and production of new skin cells, and basically banish all those pesky dark spots off your face. Here’s how we like to use it. Simply applying a paste of this vegetable can do wonders in getting rid of your dark spots. 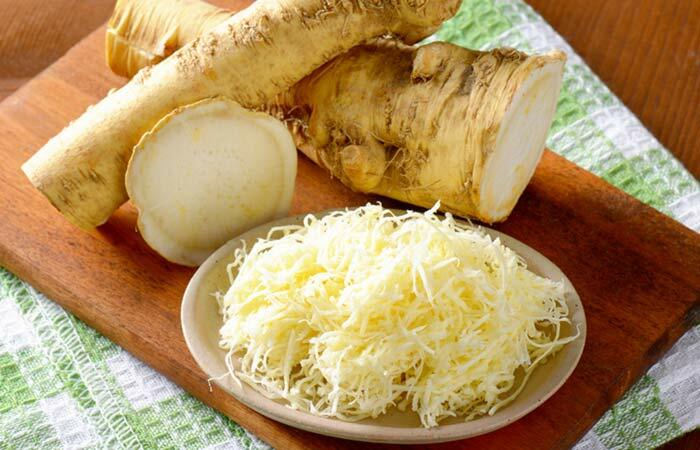 Chop up a horseradish and blend it into a paste along with a little bit of water. Apply the horseradish all over your face, paying special attention to your dark spots, and leave it on for 20 minutes. This is a perfect combination because while the horseradish reduces dark spots, the apple cider vinegar exfoliates away the dead cells, and the honey gently heals and restores the health of your skin. Blend the horseradish to a pulp. Add apple cider vinegar and honey to the horseradish paste and mix thoroughly. Make sure you load up on sunscreen when going out after using any of the above remedies as they can leave your skin sensitive and vulnerable to the UV rays of the sun. In rare cases, horseradish could cause skin and eye irritation. Pregnant and lactating women should stay away from horseradish as it has been found to cause miscarriage and other complications. You can grate 4-5 horseradishes at a time and store them in an airtight container to keep them ready for a week’s worth of home remedies. 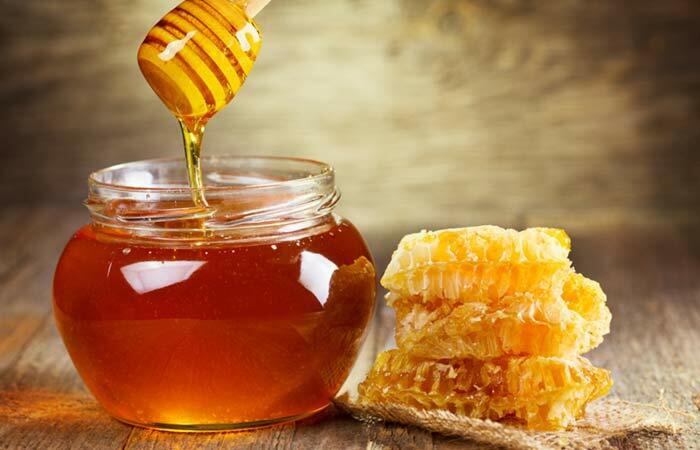 It is believed that honey never goes stale, as is proved by the fact that absolutely edible 2,000 years old honey was found in the Egyptian King Tutankhamun’s tomb. Honey has been used medicinally and cosmetically in various cultures since thousands of years. And why wouldn’t it be? It works as a great moisturizer and cleanser, and fights against acne and all signs of aging. But the best quality of honey is the one that has over 80% sugar content, which, as we all know, acts as a gentle but efficient exfoliator and removes all dead, pigmented skin cells. It also facilitates the growth of new and healthy skin cells in their place (26). So go get yourself a bottle of honey and try out these home remedies to get rid of all your dark spots for good. While the honey gently moisturizes your skin and removes dark spots, the potato removes the dead skin cells and boosts the collagen production in your skin. Finely grate the potato and add honey to it to make a paste. Apply the paste on your dark spots areas and leave it on for 20 minutes. Honey and tomato juice work wonderfully to remove dark spots and keep your skin youthful and free of wrinkles. Blend the honey and tomato juice into a paste. Using a cotton ball, apply the paste to your dark spots and leave it on until it dries. For oily skin types, it is best to do a patch test before using any honey-based home remedy to check how your skin reacts to it. Use raw or organic honey instead of the processed honey that is usually found in stores. Raw honey contains all the nutrients that are good for your skin that are otherwise filtered out of processed honey. You drink your orange juice and you eat your orange pulp, but you throw away the peel. But that’s where you are committing your biggest mistake! Orange peels contain way more vitamin C and calcium – responsible for fighting free radicals and rejuvenating new skin cells – than the actual orange pulp. Orange peels are especially great at removing dark spots because they draw out all the impurities and toxins from your skin to clean and freshen it up, and then bleach out all the pigmented areas to give you flawless glowing skin (27). 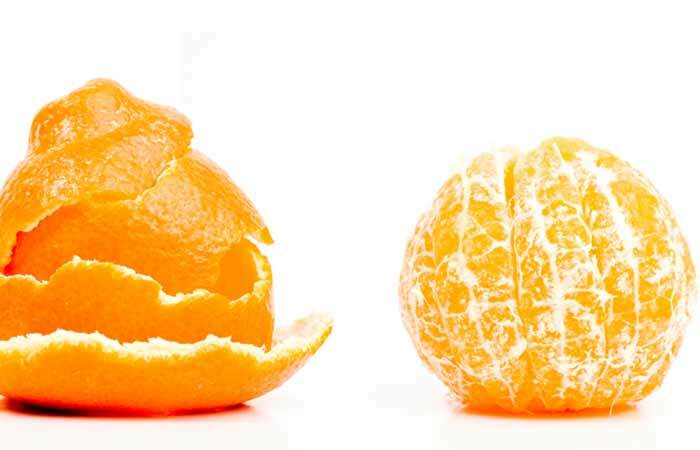 So, the next time you have an orange, don’t throw away the peels. Instead, dry them out in the sun and then grind them to get an orange peel powder that is oh-so-easy to use in the following home remedies. Mix the powdered orange peel and yogurt into a paste. The lactic and citric acids in the milk and orange peel bleach your dark spots while the honey moisturizes and softens your skin. Mix the orange peel powder, milk, and honey until they make a thick paste. Oranges that have not been grown organically may have pesticides and insecticides that could have penetrated deep into their peel. These chemicals could damage your skin. Thus, try to use organic oranges in the home remedies mentioned above. You can collect orange peels over a period of time and dry them by laying them out in the sun. Once you have collected a considerable amount of peels, grind them into a powder and store in an airtight container. This will save you time and effort in the long run. Who doesn’t love strawberries? They look cute, they taste great…as a fruit, they’ve got everything going on for them. But did you know they also work wonders for removing dark spots and brightening your skin? Strawberries contain salicylic acid, which is a really popular ingredient used in many skin care products as it is a great exfoliant and effectively removes all dead skin cells. It moisturizes and softens skins from within. But most importantly, strawberries contain alpha hydroxy acids that peel away the topmost layer of your skin and ellagic acids that are responsible for bleaching away those dark spots and lightening your overall skin tone by inhibiting the production of melanin in your skin (28). Here’s how we like using our strawberries. This yummy face pack will lighten your dark spots and give you soft and glowing skin. It’s a complete win-win! Blend the strawberries and honey together into a thick paste. This strong face mask acts as a very gentle version of a chemical peel that you can do in the comfort of your own home. Mash the strawberries into a pulp using a fork. Add the apple cider vinegar to the crushed strawberries. Don’t forget to apply sunscreen after using any of these home remedies as the acidic property of strawberries can make your skin extra sensitive to the UV rays of the sun. Use only organic strawberries. 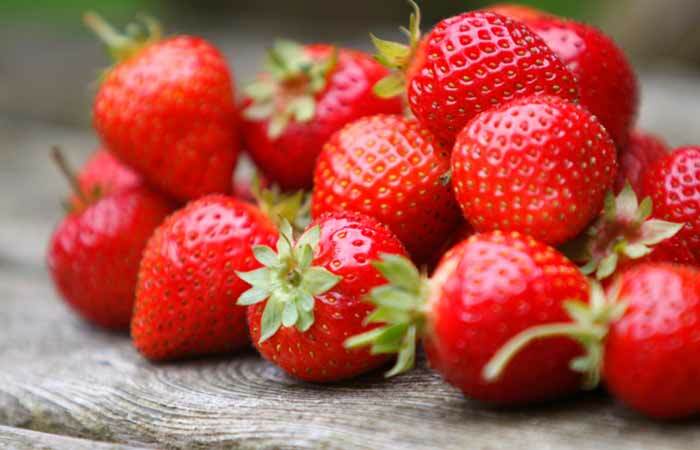 Non-organic strawberries could have all sorts of pesticides and insecticides on their skin that do not wash away with water and could harm your skin. When I was a kid, I remember seeing that bottle of bright pink calamine lotion sitting on my grandmother’s dressing table and wondering if it was something that I could drink. Of course, now I know better. All of us have probably used calamine lotion at least once in our lives for various reasons – rash, pimples, chicken pox, poison ivy, insect bites, etc. Calamine lotion is actually a mixture of zinc oxide and ferric oxide and is designed to address a number of skin care issues (29). But very few people know that it contains an ingredient called kaolin that helps reduce dark spots and even out skin tone. So, go out and grab a bottle of this magic lotion that will not only remove your dark spots but also come in handy for any and all of your skin issues. You really don’t need to mix anything in the calamine lotion to make it work. Apply calamine lotion to all your dark spots with a cotton ball. Do a patch test on the inside of your forearm to check for any redness, itchiness, or swelling to determine if you are allergic to calamine. Well, there you have it – our list of the best remedies on how to get rid of dark spots. These remedies will make your skin clear and spot-free in a matter of few weeks. Your skin will become healthier, softer, and also start to glow as these remedies have multiple benefits. You can happily say goodbye to your concealers and, probably, even your foundation. Don’t forget to let us know which ones worked best for you in the comments section below.